Do you need to cleanup a building, or have a lot of trash to dispose of at once? Home remodels, major yard projects, and removal of large items are just three of many reasons why you may need to rent a dumpster or roll-off container. 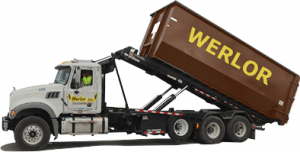 We offer prompt dumpster rental solutions for every need. 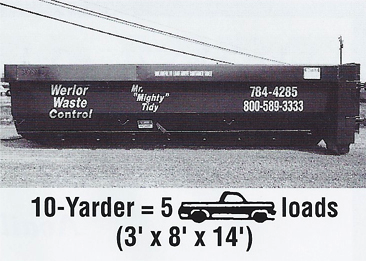 Flexible dumpster and roll-off sizes for every project. Daily, weekly, monthly, or as-needed scheduling. 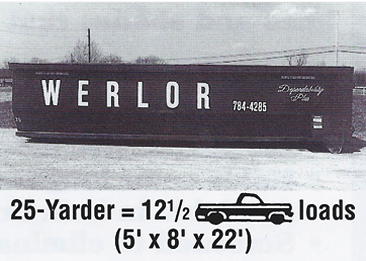 The following guide will help you determine the right size container for your project. If you are still not sure what size you might need, please contact us at 419-784-4285 we will be happy to provide you guidance in selecting the most economical container for your project. Small-sized dumpster that can be used for concrete, asphalt, brick, tile, dirt, sand and small remodel projects. 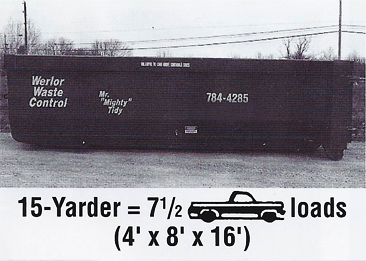 The ten yard container is our smallest roll-off container and will hold five level full pick up truck loads. 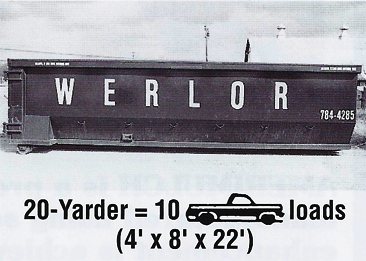 This fifteen yard dumpster will hold approximately 300 square feet of deck debris from a decking project. This is a popular size for cleaning out a 1 – 1/2 car garage. 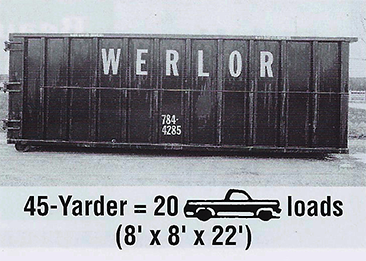 This container will hold seven and a half level full pickup loads. This twenty yard container is a popular size for larger cleanups such as roofing projects, small remodels, or home spring/summer cleaning. This dumpster is great for a 2 car garage. 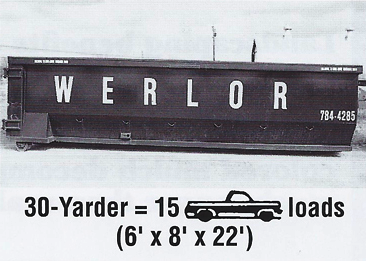 This container will hold ten level full pickup loads. This is a popular size for cleanups involving multiple buildings at a location such as a barn, basement and garage. This container will hold twelve and a half level full pickup truck loads. Mid-sized dumpster can be used for remodels or cleanups, tree trimming and light demolition. This is also a popular dumpster size for jobs involving multiple buildings at a location such as a barn, basement and garage. This container will hold 15 level full pickup truck loads. Our largest dumpster – this dumpster is for large home remodels, large cleanups and construction projects. Depending on your project and the weight and volume of materials to be hauled away, we have the right size dumpster or roll-off for you. We offer comprehensive options and equipment to efficiently meet your needs. With us, renting a dumpster is easy ! We’re here to help our schedules are flexible and tailored to work for you. Contact us for prompt delivery and pick up of your dumpster.